Adblade announced the launch of a new program that allows small businesses to affordably target local customers by placing ads on top premium sites like NBC News, Fox News and USA Today. The new program gives small businesses big media power, using Adblade’s Small Business Marketing Platform (smallbusiness.adblade.com) to target only customers within the company’s ZIP code. Priced for SMB budgets, the program offers exceptional ROI by presenting ads in Adblade’s highly effective Newsbullets format, which generates up to three times more click-throughs than standard formats. Powered by OptiServe, a self-service online ad serving platform, Adblade offers placement on brand-safe, premium sites like The Miami Herald, The New York Post, Philly.com, Forbes and many others. Adblade delivers more than 200 million monthly unique visitors. SMBs owners don’t have to worry about their ads appearing next to offensive or questionable content with Adblade, which has a high rating from AdSafe, an independent online content rating organization. And Adblade makes it easy for any small business owner to quickly upload images and text and make standard banner selections. Adblade also provides a dashboard business owners can use to measure audience response in real time to adjust messaging for maximum impact. Adblade puts big media power in the hands of smaller companies – at a price they can afford. Find out more at www.adblade.com. Adblade, a division of Adiant, is a leading online ad network that offers a unique value proposition through innovative proprietary ad units, expansive reach and distribution through only select top-tier publishers. 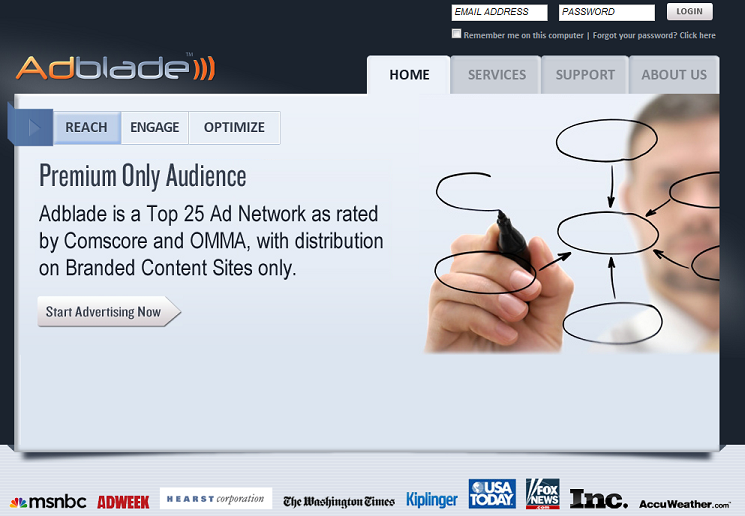 A comScore and OMMA top 25 ad network, Adblade reaches more than 200 million monthly unique users in the US through over 1,000 branded content sites. Launched in January 2008, Adblade has built its business on unique ad units, and premium placements that allow both brand advertisers and top publishers to succeed in a crowded online marketplace. With highly responsive customer support and proprietary optimization technology, Adblade provides brands, agencies and direct response advertisers with industry-leading value and ROI. Adblade is headquartered in Somerville, NJ with operations in New York, NY. For more information, visit www.adblade.com.